December 21st is a special date for many reasons. It is known as Winter Solstice – the longest night of the year. It also happens to mark the birthday of Cannery Brewing’s Assistant BrewMaster Chuck Hart. 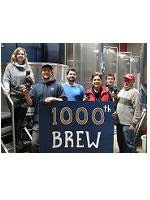 So, it seems perfectly fitting that to celebrate both of these occasions, Chuck also started brewing the 1000th batch of Cannery Brewing beer! When asked what he would be doing tonight, Hart said he’d be enjoying his birthday on the longest night of the year with the tallest, coldest glass of Cannery Brewing beer he can get his hands on. “It will definitely be a glass of Anarchist Amber Ale, which happened to be the flavour of beer that marked the 1000th brew”, said Hart.